By Warren Fiske, Sean Gorman, Nancy Madsen on Tuesday, October 7th, 2014 at 8:46 p.m.
Democratic U.S. Sen. Mark Warner, right, gestures as his opponent Republican Ed Gillespie, answers a question during Tuesday evening's Virginia U.S. Senate Debate. AP Photo. 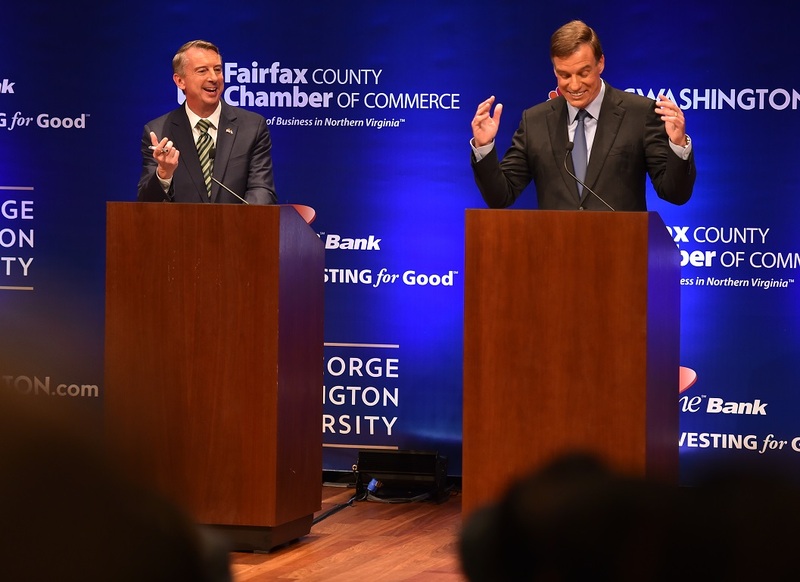 Here’s PolitiFact Virginia’s quick take on Tuesday night’s debate between U.S. Sen. Mark Warner, a Democrat, and Republican challenger Ed Gillespie. Look for more fact checks in the coming days. Gillespie: Warner has voted with President Barack Obama "97 percent of the time." According to statistics kept by CQ Weekly, a nonpartisan Washington news service, Warner has voted in accord with the president on 97 percent of the bills in which Obama has staked out a clear position. This dates to 2009, when both Warner and Obama took office. There are a few things to keep in mind. First, Obama has taken a position only 28 percent of the bills Warner has voted on, and more than half of those were for confirmation of presidential appointees. Also, Senate Democrats on the whole have backed the president 95.4 percent of the time during Warner’s term. Warner most notably backed the president when he voted for Obamacare in 2010. He’s bucked the president by voting against regulating assault weapons and against delaying the start of automatic budget cuts in 2013. Warner says the presidential support rating ignores his efforts to work across the aisle with Republicans, particularly trying to fashion a bipartisan plan to reduce debt. He correctly notes that several congressional watchdogs have rated him among the most conservative Senate Democrats. But his presidential support is what it is -- 97 percent -- and we’ve rated this claim True. Warner: Gillespie backed a comprehensive immigration reform bill last year which he now says "on the campaign trail that he’s against..."
In a CNBC interview last year, Gillespie was keen on the so-called "Gang of Eight" bill that would bolster border security and provide a pathway to citizenship for 12 million people who entered the country illegally. He described the legislation as "good policy" that "can be perfected." But this year, Gillespie’s says he would have voted against the measure. Gillespie, since at least 2006, has had a three-pronged approach to comprehensive immigration reform. He supports beefed up border security and a pathway to legal residency in the U.S.; he opposes citizenship for those who entered the country illegally. The bill, as it passed the Senate last year, would create a lengthy route to citizenship -- an action Gillespie opposes. Although his rhetoric has shifted, Gillespie has not changed his conditions for supporting comprehensive reform and we’ve concluded there’s been "No Flip" in his overall immigration stand. Gillespie: "We are now going to have a Navy that is smaller than World War I levels and an Army smaller than World War II levels." PolitiFact National recently checked this claim. Before sequestration, the Army was already planning to reduce the number of active-duty soldiers from its wartime high of 570,000 to 440,000 or 450,000. If mandated budget cuts as part of sequestration remain, the force will likely fall to 420,000 in fiscal 2016. That would be the lowest number of soldiers since 1940. In the U.S. Navy, there are now 289 battle force ships, but the Defense Department’s plans show the fleet dropping to 234 ships in fiscal 2019. That would be the smallest fleet since 1915, when there were 231. While the numbers have ebbed, that doesn’t mean capabilities are weakened. Because of technology, many experts say the U.S. military has greater capabilities than ever. Conflicts don’t necessarily require as many troops or ships as during the world wars. And the U.S. continues to spend much more on defense than other countries. PolitiFact said the statement lacked context and gave it a Half True. Warner: "I support drilling off the coast of Virginia as long as we get a share of the royalties." Warner -- as Gillespie noted -- voted against an amendment in 2012 that would have re-opened the Outer Continental Shelf for exploration for oil and natural gas as part of a five-year-plan. The amendment did not provide for revenue-sharing with seaboard states. On the other hand, Warner sponsored or co-sponsored bills calling for offshore drilling and revenue-sharing with adjacent states in 2011, 2012 and 2013. In our look at the record, we found that Warner deserved a "No Flip." Warner: Gillespie "went on T.V. and called himself a partisan warrior." The claim stems from a 2006 ABC Politics Live segment when Gillespie was asked to square two seemingly divergent roles in his career: that as former chairman of the Republican National Committee with that as founder of a lobbying and public relations firm with liberal and conservative clients. Gillespie said he viewed his business and partisan interests in different lights. He said that "my consulting firm does lobbying and public relations and advertising. And when you’re doing that for clients, for corporate clients of trade associations and others, you need to take into account both points of view. When I’m in a campaign, it’s not a bipartisan manner. I’m happy to be a partisan warrior." — Mark Warner, Saturday, July 26th, 2014. — Ed Gillespie, Friday, June 13th, 2014. 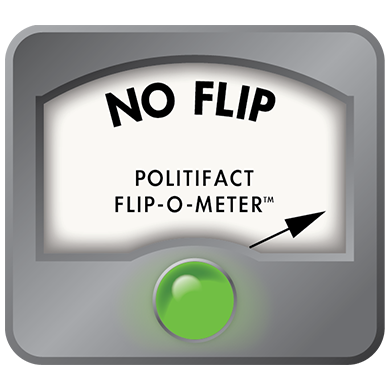 PolitiFact Virginia, "Warner has remained steady in support of offshore drilling," Aug. 18, 2014. PolitiFact, "Lindsey Graham: Army is smallest since 1940, Navy smallest since 1915," Oct. 5, 2014. PolitiFact Virginia, "In context: Gillespie labeling himself a ‘partisan warrior," Aug. 17, 2014. PolitiFact Virginia, "Ed Gillespie’s immigration reform position remains steady," July 21, 2014. PolitiFact Virginia, "Virginia GOP says Warner voted with Obama 97 percent of the time," May 15, 2014.